Re: Mandarake, what do you think? Tsumanne wrote: Mandarake is a 100% legit operation. Hands down the most famous store of it's kind in the country and has been for over 20 years. All of my experiences with Mandarake have been in person. So far I've been to the Akihabara, Nakano, Osaka, Shibuya, and Ikebukuro branches. Actually, I was just at the 8 story tall Akihabara store again last weekend. Good selection of Shinki for sale; All in their boxes and kept in a locked glass display case. Of note, I've been in the back of the Nakano branch's warehouse before. Very clean, well organized, and the workers handled everything with care. One of the warehouse workers I spoke with put my Japanese to shame by speaking immaculate English. Nice guy too. Well that's my insight on Mandarake. 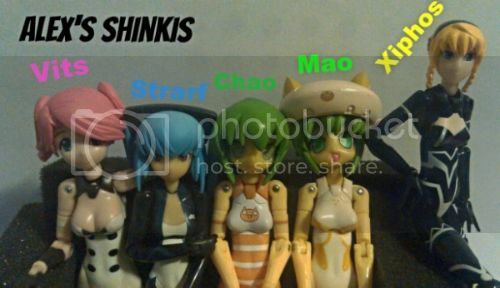 Do they have more shinkis than they put up on the website? I'm actually set to drop by Fukuoka next week and was planning on stopping by the Mandarake there. Stanisburgh wrote: Do they have more shinkis than they put up on the website? I'm actually set to drop by Fukuoka next week and was planning on stopping by the Mandarake there. I checked the English language online shop and it only listed Shinki currently for sale at the Nakano branch. To be expected I guess considering the Nakano branch is the most suited to handling international orders. Actual Store: 15+ on display. The case was completely full so maybe more in the back if I had asked. So I'm going to guess (with the exception of the auction site) that the online store is more for helping sell off overstock and not really representative of what may or may not be actually available at the store. In any case I put in a search for the Fukuoka shop on the online JP store and 5 shinki popped up. Seems promising. Thank you for all the info you have been helping with. It's very much appreciated. Tsumanne wrote: I checked the English language online shop and it only listed Shinki currently for sale at the Nakano branch. To be expected I guess considering the Nakano branch is the most suited to handling international orders. Dang... you'd have thought that they would list all the Shinki they have at each of their branches online, both on the English and Japanese site. Oh well... at least I'm thankful to get the Shinki I managed to obtain through Mandarake, and will continue to keep checking their site until I'm all caught up on the ones I want. TRANS+CRAZY wrote: Dang... you'd have thought that they would list all the Shinki they have at each of their branches online, both on the English and Japanese site. Oh well... at least I'm thankful to get the Shinki I managed to obtain through Mandarake, and will continue to keep checking their site until I'm all caught up on the ones I want. You need to take into consideration that these stores are HUGE and have lots of stock. Every day when Mandarake updates it's website, it already takes almost the whole day to get every store's new items listed. So it's only natural that not everything is listed on the site. It is a shame, but what can we do? They're not considered the largest 2nd-hand retailer in Japan for nothing. I've obtained two things from Mandarake - the Schmetterling EX Set and my Tempesta. Both came in good condition - the only flaw I saw was that Tempesta had paint defects on some of her accessories and bad nubs - but then again, she was the cheapest one at 11000 yen. And while they don't take cancellations, they are rather polite and try to at least keep communication up in English. I've bought most of my shinkis from mandarake so far, and the experience has been good, most of their "used" items are practically brand new and even the ones marked as "box heavily damaged" don't appear to be that bad. The first three i bought from the Nagoya store and the shipping was fast, took about 5-6 days from placing the order to receiving the package in the mail. although my most recent purchase is from the Nakano store and it seems as though it is going to take significantly longer. i received the shipping confirmation email a full 2 days before the package was actually accepted into japan-post's tracking system. with Nagoya it has been practically immediate from receiving the email to seeing the tracking. I'll update this post with an actual shipping time when my Xiphos gets here in a few days. Edit: she arrived on Saturday, so not nearly as long as i had expected, turns out my skepticism was completely unfounded. overall i would recommend mandarake to anyone who wants to get shinkis for a decent price. my only complaint is the high shipping costs. one shinki costs about $25 USD to ship to Washington state....still cheaper than ebay!